If you’re thinking of signing up for CyberGhost VPN but you’re wondering if they work with BBC iPlayer then this is the guide you need. I’ve been testing the CyberGhost VPN service to see if it works with BBC iPlayer so I can finally answer the question that’s on the tip of your tongue, Does CyberGhost VPN work with BBC iPlayer? CyberGhost VPN is one of the most well-known VPN services in the world. The friendly ghostie and easy to use service mean that millions of users across the world rely on their service to protect their online privacy. One of the biggest (if not the biggest) reasons many of you will be using a VPN is to access blocked services such as BBC iPlayer and others. So let’s find out once and for all if CyberGhost VPN is suitable for watching BBC iPlayer. Does CyberGhost VPN work with BBC iPlayer? You’ll be pleased to know that Yes, CyberGhost VPN does work with BBC iPlayer. In fact they’ve even got a specific option on their apps for watching BBC iPlayer. Simply choose the ‘Unblock Streaming’ option on one of their apps and then click on the ‘BBC iPlayer’ button. The CyberGhost VPN does all the work to get you connected and then on desktops even opens the BBC iPlayer website for you. This allows you to watch both live and catch-up TV no matter where you find yourself in the world. CyberGhost VPN also works with the TVPlayer service that shows BBC iPlayer live so you’ve got multiple options for watching BBC iPlayer live and the catch-up service. So if you were wondering if CyberGhost VPN works with BBC iPlayer, you now have the answer. Yes, it does. 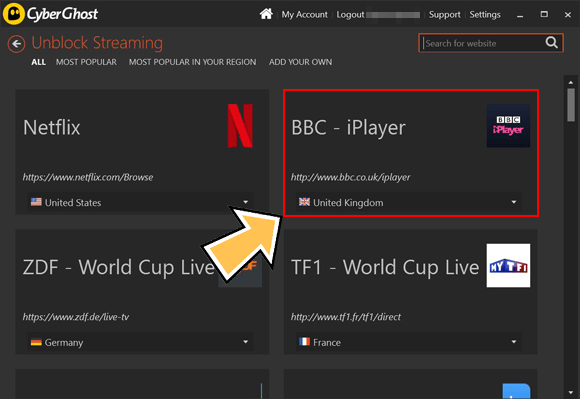 Getting the CyberGhost VPN service to watch BBC iPlayer is really simple. Go to The Apps section of the website and download the correct app type for your device. Select the Unblock Streaming option and then BBC iPlayer. The app will start to make connection for you automatically. Once it’s connected it will either open the BBC iPlayer website for you or let you know it’s connected depending on the type of device you’re using. You can then open the BBC iPlayer app. Now, instead of being blocked like before you’ll now be able to watch the BBC iPlayer service. You can also use the TVPlayer website to watch live BBC content too. CyberGhost VPN has a full range of devices covering all major systems. This includes apps for desktop and laptop computers running either Windows or Mac OS. They also have apps for both Android and Apple iOS devices meaning you can watch BBC iPlayer outside the UK on your tablet or phone too. If you’re watching on a tablet or phone you may need to download the BBC iPlayer app using an alternative method as it could be blocked on the app store outside the UK. Once you’ve got the BBC iPlayer app you can unblock it anywhere using CyberGhost VPN. 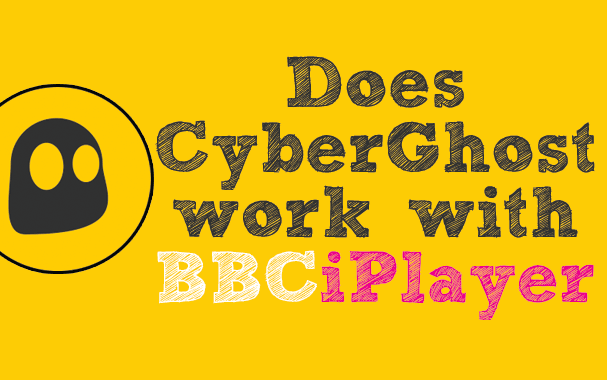 If you’ve been wondering if CyberGhost VPN works with BBC iPlayer then Yes, CyberGhost VPN works with BBC iPlayer. They have a dedicated option specifically for BBC iPlayer which means unlike some other providers if access was to become blocked they’re more than likely to resolve the issue. Some VPN providers don’t advertise the fact they work with BBC iPlayer but with the dedicated option inbuilt to the CyberGhost VPN apps it means they’re more committed to ensuring that you can access BBC iPlayer outside the UK. To watch BBC iPlayer abroad using CyberGhost VPN you’ll need to sign up for their service. You can do this by clicking the orange button below. Once you’ve signed up download their app for your device type and use the Unblock Streaming and then BBC iPlayer options. You can then watch BBC iPlayer anywhere in the world with minimal fuss and minimal set-up.